First things first: Hockey is a game. As it pertains to Penguins defenseman Olli Maatta, there are more important things in life right now. It was announced by GM Jim Rutherford on Monday afternoon that Maatta had been diagnosed some three full weeks ago with a potentially malignant tumor growing on his thyroid gland. Yes, he has been playing for three weeks with what doctors think is a high likelihood of cancer. Man this kid is tough. According to Maatta himself, he decided to keep the matter private (not one of his teammates knew) because he wanted to see if he felt “all the way back” from off-season shoulder surgery. All Holy Olli has done so far this season is appear in all eight Pens games thus far, tallying a goal and five assists to go along with a plus-six rating. His minutes per game have steadily increased in almost every contest, and he’s getting more time on the ice with the man-advantage. He has arguably been the Penguins’ best, most reliable defenseman to this point. In Rutherford’s announcement earlier in the week, it was said that Maatta would undergo surgery to remove the tumor; and that there is a very high probability that said surgery will remove all cancerous tissue. While it is a very distant secondary thought on the minds of not only all involved within the Penguins’ organization, but on the minds of anyone who follows this team: reporter, blogger, fan, etc., there is still a hockey aspect which is to be considered. The surgery should shelve Maatta for about a month, if all goes well. Maybe not even that long. Funny how these things seem to, more often than not, work themselves out. Robert Bortuzzo suffered an upper-body injury in the preseason that has cost him the first month of this campaign. While he has been skating and practicing with the team for the past week and a half, the tough question that was facing head coach Mike Johnston is who sits and opens up a spot for Bortuzzo when he’s ready to return? Make no mistake, the Pens need Bortuzzo’s physical presence in the defensive zone; specifically in front of the blue paint. The unfortunate circumstance that is Olli Maatta’s tumor makes Johnston’s decision easy. Bortuzzo will slide into Maatta’s roster spot, although who he’ll be paired with remains a mystery. Maatta has been paired with Kris Letang for most of the young season, and it would seem unlikely that Johnston would break up either of his other two pairings (Paul Martin/Christian Ehrhoff, Simon Despres/Rob Scuderi) at this point. Eventually Maatta will return, and I would have to think that at some point management will want to see Scott Harrington in a meaningful NHL game. Which means that someone won’t have a roster spot. An early-season trade is certainly not unheard of in today’s NHL, but they are few and far between. This would seem to be the most likely scenario involving the Penguins’ log jam of a blue line. 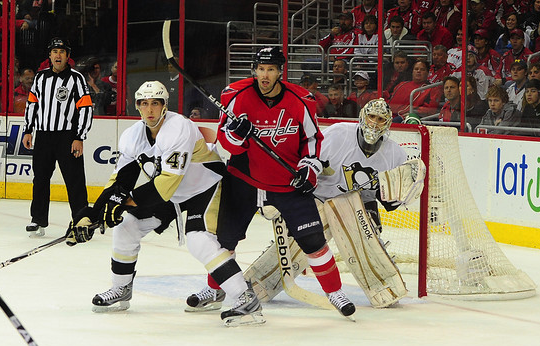 Of the current defensemen on the NHL roster: Letang, Maatta, Ehrhoff and Bortuzzo would be the safe bets to stick. Here is where it will get tricky. Scuderi’s rapidly-diminshing skill set, along with his abysmal contract make finding a trade partner seem harder than tight-roping across the Grand Canyon. Simon Despres probably has reasonable trade value, but I’m not sure that management wants to trade him. Paul Martin could likely fetch the Pens the greatest return, dependent upon the trade partner being ready to throw in the towel on this season as he will be a UFA come July 1, 2015. It was said to me over the weekend by a very knowledgeable and well-respected Pittsburgh sports media personality (off the record, unfortunately), that management is also not keen on dealing Martin prior to the end of the season. They value his leadership and veteran presence, and believe that the more he and Ehrhoff play together, the better each will become. To boot, Martin’s steady play in each of the past two postseasons is another factor management is taking under consideration. Which leaves Despres. His value is slowly but surely rising among NHL scouts and GMs, and it seems the more consistently he plays (it seemed under Dan Bylsma that Despres couldn’t string together more than four or five games in a row due to poor play) the better and more comfortable he becomes. This is just the log jam on the surface. Remember, the Penguins have a plethora of talented young D-men waiting in the wings in Wilkes-Barre/Scranton. Guys like Derrick Pouliot, Brian Dumoulin, Harrison Ruopp and Taylor Chorney to name a handful. I would expect Rutherford to pull off something before Christmas. 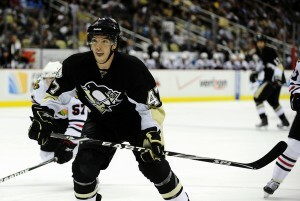 He has the pieces to make a deal work, plus the Penguins are still in need of one more top-six winger.